In the first part of this blog we discussed being present in all the chaos of life. If we wait until everything is calm and peaceful before we can become present, we will either wait a long time (maybe forever) or rarely be present in our lives. Most importantly, when we are present, we are able to experience the presence of God in powerful ways. We slow down enough to realize God is with us and wants us to look to him. Imagine having God right by your side to guide you through life, but never taking the time to listen to him or ask him for anything. Crazy, right? But we are all guilty of this because instead of being consumed by God in the present, we are consumed with everything else. How do we practice being present so we can experience a closer connection with God? 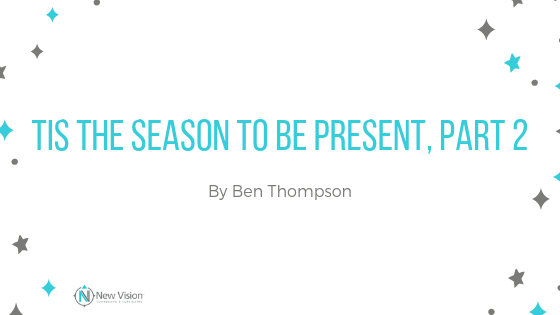 In the first part of this blog we discussed being present in all the chaos of life. If we wait until everything is calm and peaceful before we can become present, we will either wait a longtime (maybe forever) or rarely be present in our lives. Breathe! Breathing is the quickest and easiest way to reorient our bodies and minds to the present moment. I recommend taking slightly deeper breaths than normal and simply focus on the in and out of your breath. As you are more connected to your breathing and to the moment, you can then feel the presence of God more fully. Be quiet and listen. This is especially important in times you are having a heated conversation with someone or find yourself mentally obsessing over something. Simply tell yourself to slow down and pay attention to what is going on around you and inside you. Your body, for example, may be trying to tell you, “Hey there, I’m getting pretty hot and frustrated here. I need a break!” Then, you can take the little break that your heart, body, and probably everyone around you knows you need to take. As you quiet down, this will allow you to listen better to God in whatever ways he is speaking to you. Surrender. Don’t confuse this with giving up or giving in to your feelings. Surrender means accepting that your thoughts and feelings are currently too hard to let go of and you must give them over to God before they take you over (see Psalm 55:22). The next time you find yourself frustrated and getting angry tell yourself, “Surrender to this. You are upset and feeling out of control. God I am giving you control,” and allow yourself to experience God taking care of you and your emotions. Being present takes practice. At New Vision we are here to help you become more present in your life and more connected to God. If we can help in any way, don’t hesitate to reach out to us. We have great therapists who want you to experience a more present and connected life with God, yourself, and others.